Despite their dubious role in the financial crisis of 2008, some US banks were deemed by policy-makers to be ‘too big to fail’ because their failure would have led to a global economic meltdown. Rightly or wrongly, that conclusion triggered an unprecedented international effort to rehabilitate them and restore global financial prosperity. As South Africa seeks a new path to economic growth and development, we must face up to the reality that our public education system is too big to keep failing. Those who think that private schooling is the answer do not grasp that commercial operators cherry-pick children who can afford to pay – and that is no more than a quarter of all learners. The rest rely on the state of public education, which will make or break our society over the next decade. As it is, every bright-eyed child who started Grade 1 in a public school this year has only a fifty-fifty chance of completing Grade 12. That is the main reason why unemployment is so high. It is the elephant in the room. If we do not confront it, our renewed efforts to stimulate the economy and accelerate jobs for young people will fail too. The starting point is to provide different signals of success to education officials; because the current ones prompt them to push struggling learners out of school, to make their results look better. In 2017, the Free State province was fêted as the top achiever in Grade 12, despite the fact that the size of the matric class was just a third of that of the Grade 10 class in 2015. Did the majority drop out, or were they pushed? National senior certificate results only make sense when stacked up against dropout rates. Even then, these measures are lag indicators; by the time they give us data about any cohort of learners, it is too late to do anything about it. It may take years to turn the education system around, but we need to know within the next three years that we are on a fundamentally different trajectory. We cannot wait for twelve. It is time to focus on the main lead indicators of basic education, namely the proportion of children who participate in early childhood development programmes, and the fraction who pass through the first three years of school without having to repeat. After all, if children are on track by Grade 4, they will almost invariably succeed. If not, they will fail and drop out of school. Having spent the last three years trying to understand why a large proportion of our schools keep failing, it is clear to me that we cannot instantly do everything that is required to transform the system. However, we can do the most important things differently. As I see it, the problem of failing schools boils down to three main factors, namely: teachers who can’t or won’t teach; children who can’t learn at the pace and level at which they are being taught; and school governing bodies and principals that can’t lead properly. These conclusions may appear simplistic – but arguably, simple is what we need now. 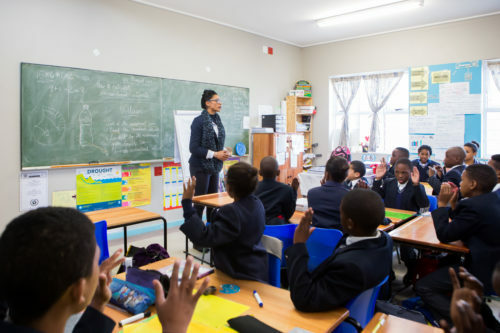 In a partnership pilot implemented in eight public schools in the Western Cape (called Collaboration Schools), it soon emerged that most teachers were keen to work and develop their skills, but a few – irrespective of trade union affiliation – were not. Despite the efforts of the willing teachers and extra support to the school, little seemed to change until the Premier and education department put together a performance unit to handle staff matters expeditiously. This relatively small change in process meant that principals could start to develop effective human resource strategies for their schools as a whole, developing teachers and disciplining them where necessary. Another important breakthrough was the Head of Department’s approval, on a pilot school-by-school basis, to adapt the curriculum to fit the learners’ level of skills. This, in the words of Premier Helen Zille, may “stop children hurtling headlong over the cliff like lemmings even as their parents think they’re getting a good education”. In schools where over half the Grade Sevens read and do maths at a Grade 3 level, you cannot keep teaching the standard curriculum to them and expect them to pass! The third critical strategy is to build school leadership capacity. In the Collaboration Schools pilot, a ‘fifty-fifty partnership’ on the school governing body (SGB) between the school community and the school operating partner has proved most appealing to parents. Getting real-partnership right has not been easy, as the parties try to establish the optimal balance of power between parents and outside experts. If we have learnt anything, it is just how crucial the right mix is to the success of the school. Two years in, we have the first evidence that the pilot schools are now on a different trajectory to that when they started. In the primary schools, the overall pass rate improved from 17% to 29% over the past year, while their average learner scores increased from 34% to 40%. Children in the younger grades showed the most consistent improvements. The biggest gains were in Grade 3, with one school showing a fifty percentage-point increase in its mathematics mark. Perhaps most exciting was evidence that the overall distribution of marks – even among those children who still failed – is moving upwards. Fewer children failed badly, meaning that there is hope for them yet. This partnership has shown that things can start to change quite quickly. Sceptics will point out it costs extra money and may not be sustainable over the long term. Maybe, but we will save millions of Rands by not having to teach the same children the same lessons twice – because they no longer fail. That will free up a lot of money into the system, and perhaps open new pathways to sustainability.